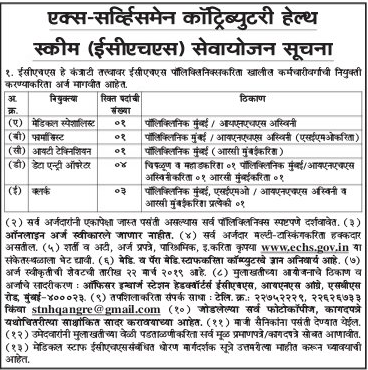 ESHS Mumbai (Ex-Serviceman Contributory Health Scheme Mumbai), Mumbai published a new job notification for Medical Specialist, Pharmacist, IT Technician, Data Entry Operator & Clerk Posts. The recruitment is for total 10 Vacancies. The willing candidates are informed to see the latest notification February 2019. Last Date of offline application is 22-03-2019. For More details of ESHS Mumbai Recruitment 2019 Read Below. Interested & Eligible candidates can send their application along with all the necessary documents and testimonials to ऑफिसर इन्चार्ज स्टेशन हेडक्वार्टर्स ECHS, INS आंग्रे, SBS रोड, मुंबई – 400023. Application starts offline 23-02-2019. Last Date of application is 22-03-2019.